Apart from the animations, sounds can be also triggered by a certain tag value read from the PLC. They can be set for each view separately. 1. Select the view from the Project window in which you want to play the sounds. 2. 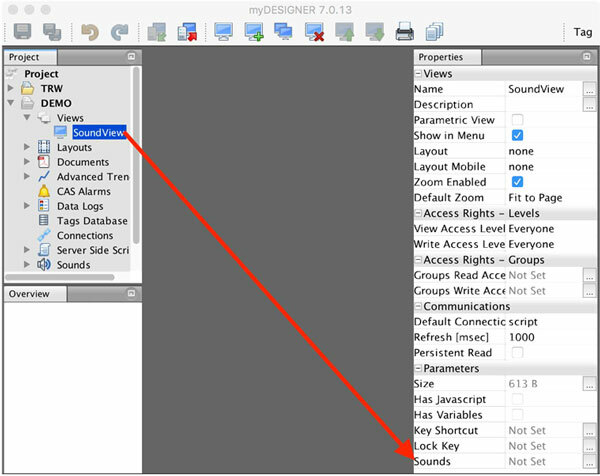 Navigate to the Parameters section in the Properties window and click on the ‘…’ button. 3. In the dialog window, click on the button +Add to add the triggering tag, and then select the sound file you want to play. 4. Set Severity, Repeat Count, Volume, and Min & Max tag range and click on the Set button to confirm.